In the last quarter of the ninteenth century through the middle twentieth century, dozens of Chinese immigrants called Big Timber, Montana home. Justin Moschelle, a Master's student at the University of Montana is undertaking a historical and archaeological investigation of this community. During the summer of 2008, Justin Moschelle and Chris Merritt will supervise an archaeological field school to uncover the lost fragments of Big Timber's Chinatown. During construction of the Northern Pacific Railroad in the 1880s, hundreds of Chinese workers were employed across the state of Montana. In 1883, some of these Chinese immigrants came to Big Timber, Montana as part of the railroad crews. Some Chinese stayed in the town after the railroad had passed, and started up a variety of businesses, including restaurants and laundries. Located roughly eighty miles west of Billings, in south-central Montana, Big Timber had a small but prominent Chinese community until the 1930s. In the 1880s, the city block bounded by Anderson, First, Mcleod, and Front streets became the unofficial Chinatown of Big Timber. For various reasons, that will be part of the proposed study, it seems that the majority of Chinese residences and businesses clustered on this block. There were four Chinese restaurants spread throughout Big Timber, and were called the Home, Half Moon Cafe, the Golden Eagle, and an unamed restaurant located in the heart of Chinatown. One historical account suggests that the Big Timber Chinese dominated the eating establishments in town, and stated that "eating out meant eating Chinese (Thompson 1985:1)". It is the unnamed Chinese restaurant that is the focus of Moschelle's thesis project, and will be tested archaeologically. 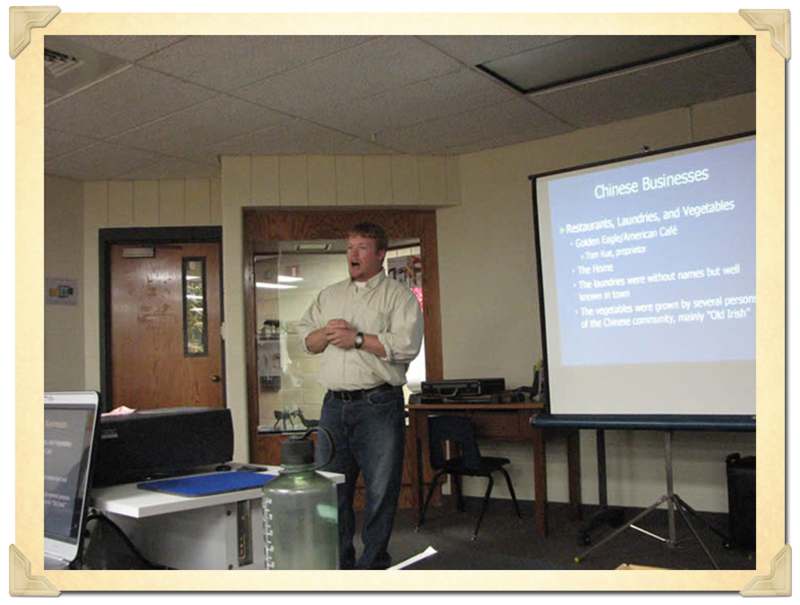 Tom Kue, a prominent Chinese entrepreneur, owned and operated the Golden Eagle restaurant in Big Timber. In addition, Kue invested a lot of his personal wealth in developing portions of Big Timber's downtown. 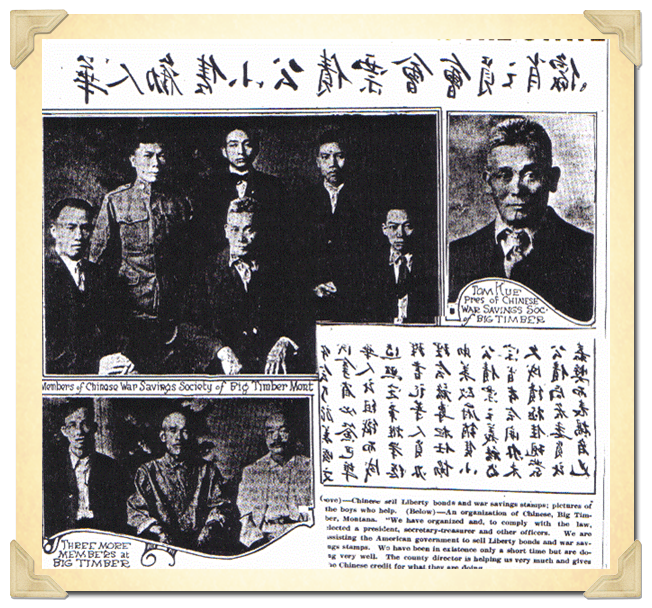 During World War I, Kue was the chairman of the Big Timber Chinese War Savings Bond Society, which was organized to support the war effort and helped to give the Chinese community a positive image in town. You can read about this society in the Mineral County Independent newspaper extractions found under the "Research Resources" page. Big Timber Chinese War Bonds Society. During the 1930s, the last Chinese residents left the area, presumably to larger Chinese settelments in California or even back to China. All that is left of the Chinese prescence in Big Timber, are a handful of artifacts and stories of Chinese tunnels and the opium trade. Such tunnels allegedly served as passages for the Chinese to move from business to business to buy and sell illicit goods, including opium. The persistence of these Chinese tunnels rumors, is an interesting part of the story of Big Timber's Chinatown, and will be addressed through this research program. Other reputed Chinese tunnels in other U.S. cities have been debunked, and only archaeological and historical work will end this debate with Big Timber's living community.